What is Arizona Road Racers? The club was incorporated in November, 1970, as a non-profit organization to promote running for health and fitness. The ARR is governed by a volunteer Board of Directors. It is easy. Just check out our member page and you can join online or mail in an application. Once you sign up you will immediately be eligible for all the great benefits of membership. Does ARR have any organized workouts or training? Yes. We have weekly track workouts for members on Tuesday nights. Each week we feature a different workout Make sure you check our Facebook page or the website for each week’s workout. Can ARR Stage our race? Presently, the club produces 11 runs each year, from 1 mile to marathons. However, we do not stage races for other organizations. We are happy to recommend partners to assist you in providing equipment and expertise for your event. How does ARR time races? We use chip timing for all our competitive races. Results are available immediately at the event and are usually posted online by early afternoon the day of the event. Yes! Running strollers are permitted but we ask that you start at the back of the line. Our races are chip-timed so it doesn’t matter when you start the race. Yes. Enjoy your tunes. Just be safe and considerate of your fellow runners. 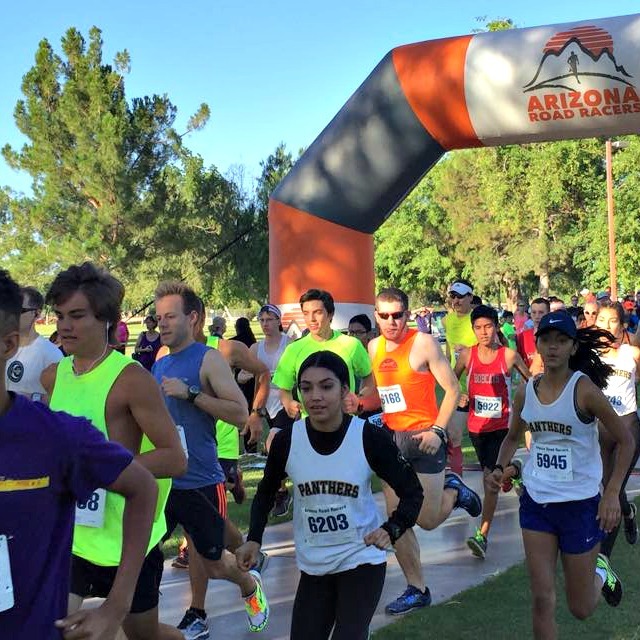 Is the Desert Classic Marathon a Boston Qualifier? Yes it is! So run fast. Here are the times you will need to run in order to qualify. While we love pooches, dogs are not allowed on the course. They are allowed in the registration area if you have a family member or friend that can watch them while you run. We are a non-profit organization and we rely heavily on volunteers to run our races. There are all sorts of opportunities from helping with registration to working aid stations to cooking burgers after the 4th of July Race. We have positions for almost all age levels so make volunteering a family affair. As a thank you we offer ARR Bucks ($5 value) that can be redeemed for entry to later races or any other ARR fee. Click here to see all the various opportunities for each race. • Company / organization name, logo, and link on the event web page and social media.